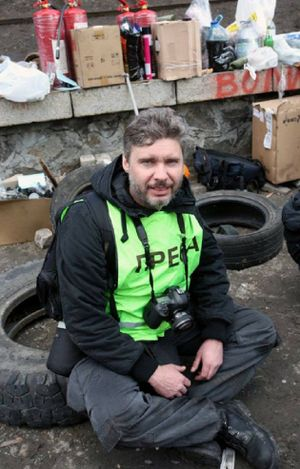 Andre Stenin was a Russian photojournalist with Rossiya Segodnya (formerly RIA Novosti), specializing in conflict zone reporting (Egypt, Syria, Ukraine). He was killed under contested circumstances in eastern Ukraine near Lugansk, apparently on August 6, 2014. 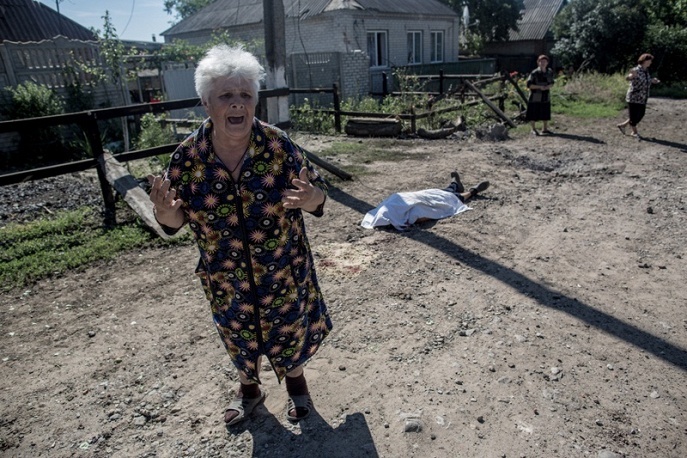 Stenin was making reports from Donetsk, Sloviansk and other cities and towns of Ukraine's embattled southeast, with his last photos showing life and death in Sloviansk. Contact with him was lost on August 5, and he was reportedly killed the next day in an attack on a convoy studied here as Rozsypne Road of Death (his sub-section there), on a stretch of road near Snizhne. There were rumors started by Kiev in mid-August that Stenin had been captured by their military forces, but this appears to have been only to negotiate the release of someone alive. On August 22, pro-Kremlin newspaper Komsomolskaya Pravda published an article by its reporters Dmitry Steshin and Aleksandr Kots, who had gone in search of Stenin. The article, later removed from the website but available in Google cache, said Steshin and Kots had found a burned car, similar to the one that Stenin was last seen in, with three charred bodies inside and professional photo equipment in the trunk. They reported that the car was found in a field near the town of Snizhne. The other two victims have not been identified. The Investigative Committee and Rossiya Segodnya accused Ukrainian paratroopers with the 79th airborne brigade of killing Stenin during the alleged attack in August. Aleksandr Danilyuk, from the Ukrainian Defense Ministry, denied the accusations, and told the BBC's Russian service he had seen no evidence confirming Stenin was killed by Ukrainian soldiers. However, Anton Gerashchenko, an adviser to the Ukrainian Interior Minister, said, “As far as I know he has been arrested by our security service.” He later retracted his statement. I attempted to contact the Ministry of Internal Affairs and Security Service of Ukraine, but no one was willing to give a statement. This page was last edited on 2 August 2017, at 08:26.